Jerkbaits (sometimes referred to as stickbaits) average 6 to 8 inches in length and are shaped like a slim cigar, sometimes straight, sometimes slightly curved or you may find them with a jointed mid-section. 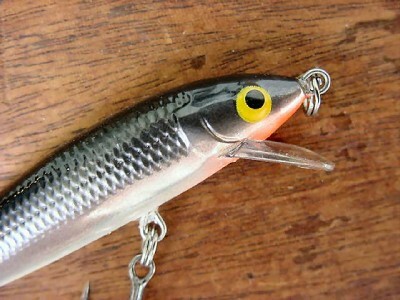 Not to be confused with top water lures, jerkbaits have a small lip, which assists in the diving process. With the use of adhesive lead dots or strip weights and water fillable apertures, these lures can be adjusted to any depth, giving an “in your face” presentation, something a bass cannot resist. Several types are available on the market, however few of them offer versatility or “out of the pack” performance with (in my opinion) the exception of Norman Lures and Rapala the use of which I will detail after I have explained the tackle and types of retrieve. Lure retrieval is dependent upon location. In deep water, I prefer to cast with a 6 and a half to 7 foot medium-heavy action pole as far as I possibly can, then immediately crank the reel to make the lure dive. Remember, the more you crank, the deeper the bait will travel. It is important to note that the deeper you crank, the less time you will have to keep the lure at the optimum depth, as you are not only diving the lure, but bringing it back towards you. This will shorten the life of the presentation, so accuracy is critical and long casts are vital. Light line will aid you in the speed at which the lure dives. I prefer 12 to 15 pound test for this application. Reel ratio is not so important as mentioned in previous articles, however for my own use, I personally prefer a lower 4.5 to 1 ratio. I like to leave the lure motionless for at least 10 seconds before I twitch the lure and retrieve two or three turns of line onto the reel. This should be repeated until the lure is back at the boat. Watch for fish to follow the lure also. I have caught bass right under the boat when they strike the lure as it moves upwards to the surface. If this method does not produce strikes (usually on the pause) I like to drag the lure with a sweeping motion and return the rod tip towards the lure retrieving line as I do so, thereby keeping in constant contact with the lure. Again, strikes will usually occur on the pause or as you begin the retrieve. For shallow water, a shorter 6-foot to 6 and a half foot pole, is best with a medium heavy action. Heavier line will keep the lure higher in the water and will help minimize snagging the tops of weedbeds or submerged bushes. The retrieves remain the same, however I speed up the presentation, as the bass tend to get a better look at the lure in shallow water than they do in the darker depths. Norman’s RIP-N-RIC are water fillable, using a small syringe supplied with the lures. Injecting small amounts of water gives neutral buoyancy to the lure when cranked to the desired depth. I will occasionally add lead adhesive weights to these lures if I need a rapid fall, especially in moving water, where the strike zone is only accessible for a limited time. Rapala lures require little or no adjustment as they suspend when you stop turning the reel or pause on a sweeping rod movement, they do rise very, very slowly when you stop reeling. I occasionally like to add even amounts of lead to the head and tail usually around the hook mounting, to ensure stability and balance. The only major change I will ever make to any store purchased lure, is to remove the hooks and replace them with higher graded hooks such as Gamakatsu if they are not already equipped. In the heat of the summer in many parts of the country, bass fishing during the day time can be brutal. With air temperatures that can rise well past the 100 degrees mark in the shade, it doesn’t make for a good time on the water. In many lakes, ponds and even rivers, most bass have made transitions towards deeper and cooler water. Fishing offshore structures put us, the angler right out in the middle on the lake with no protection from direct sunlight. During these times, I have found night fishing to be a great alternative to battling the scorching sun. Worm fishing is a technique that every bass angler should know. Like most methods of fishing, some require additional skills like ” reading the line”. Others require us to use our “sixth sense” to detect those soft or delicate bites from bass. Well welcome to the world of worm fishing, because this is a combination of everything I just mentioned and more! NOTE: -When I use the word worm, I am also referring to other soft plastic shapes and creatures, which can be fished by these methods. Yoga – Spiritual and physical exercises to encourage health and well-being. A Hindu discipline aimed at achieving a state of perfect spiritual insight and tranquility. When I’m out on the lake, I usually fish as if I’m practicing for a tournament. I do this not because I’m practicing or want to be competitive, but because I want to be as efficient as possible. I don’t get out on the water as much as I would like anymore, so when I am out fishing, I have to find them and dial the pattern in as fast as possible.